Hoy quiero mostrarles el proyecto que prepare para el desafió de More than Words, este mes la palabra era memorias y se debia agregar un marco al proyecto. Aquí pueden ver el Board. 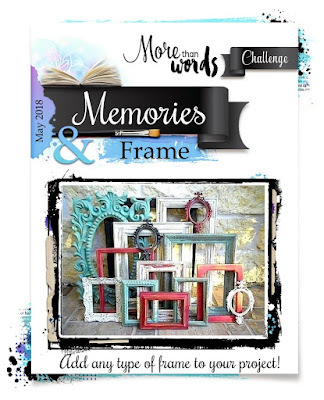 Today I want to show you the new project I prepared for the More Than Words Main Challenge, this month the word was memories and you need to add a frame to the proyect. Here you can see the Board. Como saben este mes de Mayo es el día de la madre, y para mi uno de los recuerdos más bonitos que tengo con mi mamá, es cuando ella nos mostraba su álbum de matrimonio y nos contaba como se había enamorado de mi papá, de esas fotos del álbum la que use en mi proyecto es una de mis favoritas, es una foto de su luna de miel en los lagos de Chile, donde ella se ve muy soñadora mirando el lago. Like you know, at least in my country, in May we celebrated Mother's day and one of the best memories I have with my mother was when she show us her wedding album and she tell us the history when se fell in love with my father, from those pictures, the one I used in the project is my favorite, is a picture from their honeymoon in Chile lakes, she looks so pretty and dreamy looking to the lake. Para el proyecto use varios productos de Finnabair, como su pasta craqueladora, opal acrylic paints, waxes, escamas de mica y piedritas de diferentes tamaños, también use varios acrílicos de todos rosas y rojos para colorear el fondo. For the project I used several productos from Finnabair like the crackle paste, opal acrylic paints, waxes, mica flakes and art stones, I also use acrylic paint in red and pink tones for the background. Espero les haya gustado, aquí les dejo algunos acercamientos. I hope you like it, here I leave you some details of the project. Un enorme abrazo a todos ya nos estamos viendo prontito. Such a wonderful project and emotional memory! Thank you for playing with us More Than Words! Thank you Anat it was fun playing with you. Oh wow - this is amazing! I love that you scrapped a photo that means so much to you and your heart-shaped canvas is very cool! Thanks for playing along at More Than Words this month. Thank you Heather, first time participating, I will try to do it more often. Thank you Janice, the heart was fun to do. Thank you, it was fun, lets see if can get with this month challenge. Thank you I tried to my best. So very beautiful! The texture you were able to create on your base is amazing! Thank you for playing along with us at More Than Words!